OLAS offers culturally and linguistically appropriate community support services to LGBT individuals who have faced forced migration from Latin America. Our goal is to jump start a holistic healing process from the violence and discrimination that our participants have faced in their countries of origin. ​​One day workshops are on a sliding scale from 0-$10 and weekends are $30, with no one turned away for lack of funds. This includes food, lodging, transportation and programming. Many of our participants are underemployed and/or work in minimum wage jobs, so we aim for 100% financial accessibility. Many of our participants cannot easily schedule regular time away from work to access traditional mental health services but often can request one weekend off. Are offered in the native language of our participants Although some of our participants are bilingual, it is more comfortable and meaningful for them to receive these services in their first language. ​Group therapy is particularly powerful given the importance of immediate and extended family ties that exist in the Latino community. ​Many of our participants come from cultures in which naturalistic healing modalities are highly regarded. Our retreats include various holistic practices such as art therapies, mindfulness meditation and guided imagery. ​Many of our participants come from cultures in which religion plays an important role and have been ostracized from their religious communities. Our events value the sacred within the therapeutic environment. All are welcome regardless of religious affiliation or lack thereof. ​We believe natural settings are healing in and of themselves. 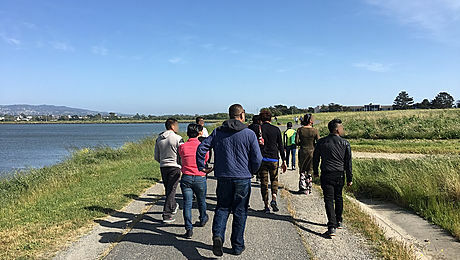 We often schedule a nature walk into the program as well as open air activities that emphasize our connection with the natural world. Basic meditations for calming body and mind, focused relaxation exercises, suggestions for self-care, nature walks. ﻿Focus on respect and appreciation for one another as core values of the retreat, games and exercises that get people working together, also meal preparation and clean up together. Focus on self-care and healthy living. We believe that treating our bodies with respect is an important aspect of self-esteem. No drugs/alcohol policy. Healthy, mostly vegetarian meals. Specific exercises that give participants an opportunity to appreciate themselves and one another. We always include a nature walk or hike as part of our program. We incorporate gratitude, kindness, deep listening and contemplation as core values of our retreats. All of our services are non-creedal and everyone is welcome regardless of their religious beliefs or lack thereof.